What is the Best Acoustic Guitar? Choosing an acoustic guitar can be overwhelming with so many possible options. I felt the same way when picking out a guitar for myself recently. And this is where this guide comes in. After spending a significant chunk of time looking at guitar models, their specs, tonal quality, potential issues people have with any particular model, etc., I've decided on a recommendation. Based on everything I’ve found, if I were buying an acoustic guitar today and wanted a great-sounding acoustic that was well-rounded (and at a good price point! 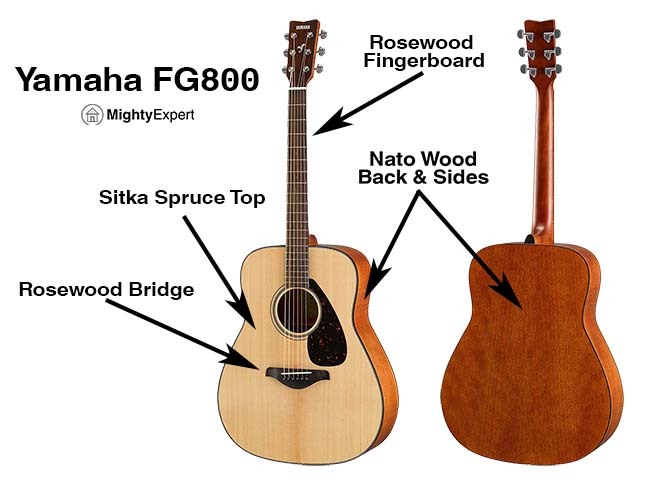 ), I would choose the Yamaha FG800: Link to FG800 Package (Amazon) or Link to FG800 Guitar by Itself (Amazon). If I wanted a guitar that sounded really good and planned on staying loyal to the Yamaha brand, I would upgrade from the FG800 to a Yamaha FG830. If I was looking for extraordinary quality at a price under $600, I would choose the Canadian-made Seagull S6. And if I was on an extreme budget without much wiggle room, I would buy the Jasmine S34C NEX. 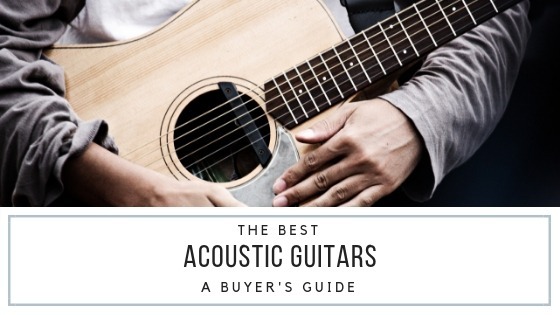 Looking for more budget acoustic guitar options? I made a list of Acoustic Guitars Under $500 that might be along the lines of what you're looking for. If you’re brand new to guitar and want to get everything as a set, I'd recommend you get the package. There’s a good package with all of the accessories you’ll need available from Yamaha. The FG800 Package includes a hard shell case, guitar tuner, guitar picks, capo, extra set of Martin strings, a guitar strap, a guitar stand, and finally the FG800 itself. You won’t have to buy anything else separately. When I bought my first guitar I got a package and it worked out great. It made it easier for me to focus on learning rather than realizing I didn’t have something and having to go out and buy more stuff. If you’ve already got the basics like a stand, capo, guitar tuner, case, etc., then you can get the FG800 guitar by itself without any accessories. It’s a great guitar for all levels of play. It doesn’t matter if you’re just getting started with playing guitar, if you’ve been playing on the side as a hobby, or even if you’re on a more advanced level, this is a guitar that will not disappoint. It sounds amazing right out of the box (has a very rich sound), way better than a lot of budget starter models. And it doesn’t cost an arm and a leg! It’s not a flashy guitar, but it’s well-built, looks excellent, and sounds just as good as a more expensive acoustic. It also feels really good to hold. It doesn’t feel uncomfortable or “off” in any way, it just has that good, comfortable feel to it. Before we get into any details, I wanted to say that this is a very popular, mass-produced guitar. This means that it’s factory-made and sometimes has the chance of seeing some defects during production (just like any mass-produced product would). But that’s why they have quality control (QC) processes, and usually, this picks up any defects. If you decide to buy an FG800 (or any guitar, really - you should always do this), I’d recommend you take a look and inspecting it all around when you first take it out of the box. If you notice anything strange like a crack or if something just doesn’t look right, you’ll easily be able to get a new one shipped. Nobody I personally know has had any issues, but it’s just something to be aware of. The FG800 has a solid Sitka Spruce Top, which is a preferred material for acoustic guitars due to its elasticity and strength. Using sitka in a guitar top allows the instrument generate a very broad dynamic range, making it suitable for a lot of different playstyles like fingerpicking, flatpicking, or aggressive strumming. It also gives it a nice mellow root tone. This wood is typically a white, pinkish, or light brown color, and can endure quite a bit of abuse and rougher handling. If you want some more details on Sitka Spruce, take a look at this wiki article (there are pictures of the different grades of wood, which depends on how many grains and defects there are ). The back and sides are made of Nato Wood (often called ‘eastern mahogany’). If used in a guitar, Nato Wood has great tonal output and looks really good with its reddish-brown shade. It’s a wood gathered from Mora trees (here’s a picture of a Mora tree if you’re interested). They tend to grow in lowland rainforests, mainly found in Central America and South America. It’s a reddish-brown wood that sometimes has lighter or darker streaks that can be seen along the grains. Last but not least, the fingerboard and bridge of the FG800 are made of Rosewood. When used in guitars, Rosewood has a nice reverberant quality to it, producing clear, strong tones at the low end and very rich tones at the high end.